ABSTRACT: The first Ordovician foraminifers in South America are described from Middle Ordovician (Darriwilian)strata of the upper part of the San Juan Formation, Argentina. 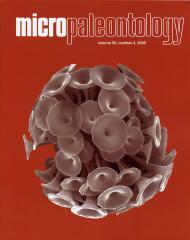 The foraminifers are found together with conodonts of the Eoplacognathus pseudoplanus /Dzikodus tablepointensis Zone that enhances the stratigraphic significance of the foraminifers. The assemblage of foraminifers described includes the agglutinated genera Lakites, Amphitremoida, Lavella, Ordovicina and Pelosina. The distribution of the genera Lakites and Lavella, previously known only from the Lower Ordovician, Floian (Tetragraptus phyllograptoides graptolite Zone), now can be extended up into the Middle Ordovician (Darriwilian). The find of representatives of the xenophyophorean genus Pelosina extends the first appearance of this genus down into the Middle Ordovician.